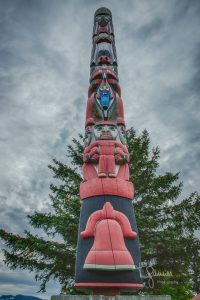 The Sheldon Museum of Haines Alaska promotes an annual half-marathon fundraiser which not only serves to support the museum’s programs, but also celebrates the town’s heritage of totem poles. 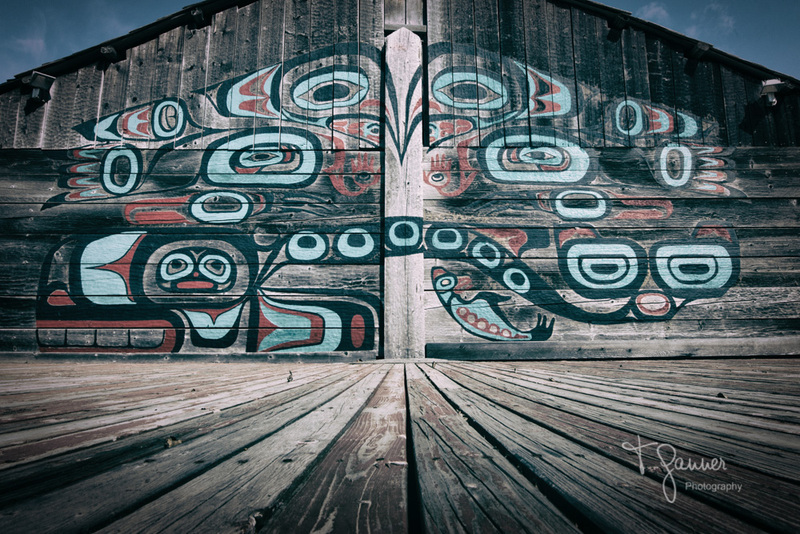 Totemic art is intrinsic to the northwest indigenous culture and the local Tlingit people have been creators and stewards of some of the finest works for hundreds of years. With the encroachment of the European Christian cultures, much of this art was suppressed, lost, or acquired leading to a significant dilution of local indigenous heritage. As times changed and values evolved there has been a concerted effort on many fronts to acknowledge the value of the local heritage and promote a renaissance of totemic and related arts. Carl Heinmiller and Alaskan Indian Arts located in the historic Fort Wm. H. Seward played a significant role in reinvigorating interest and talent toward the resurgence of the craft of design and carving. 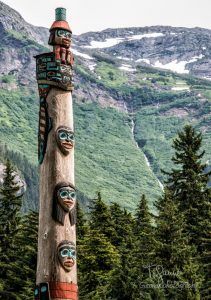 These sustained efforts have helped to promote a proliferation of totem art in and around the town of Haines, Alaska. Many visitors to Haines appreciate the iconic nature of indigenous-style totems. They also are curious as to what the figures represent, and what story the pole may tell. Toward better understanding what the poles represent, I offer information gleaned from the Sheldom Museum, and include carvers and dates where possible. I have tossed in some additional information, annotations, or quips where available or appropriate. I have italicized those annotations, by and large. A description of the poles is presented in the order of their appearance along the route of the half-marathon. An expanded collection of higher resolution images can be found at the Blog: Totems of Haines Each of the photos is linked to its higher resolution image on that Blog. Just click on them for a new window and higher res image. Happy trails! 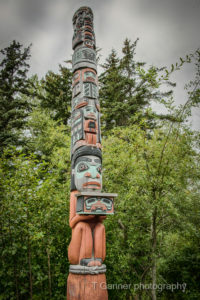 This 16-foot-tall pole celebrates the Folletti-Clayton family and stands at the Chilkoot Haven Lodge. Sue Foletti is a member of the Chilkoot Tlingit people and explained the pole to me some years ago. From Sue I learned totem poles are read from the bottom up. At the time of the carving, Sue’s grandmother was the matriarch of the family, and being the most important and honored member of the family, she supported the rest of the family. From the base up, the pole depicts a frog (grandmother’s clan), a raven with a halibut in its beak (Sue Folletti’s father, a commercial halibut fisherman) and an eagle head in its wing (representing Sue’s mother. Sue is represented by the eagle, as she remained in her mother’s clan. Three faces representing Sue’s children areDavid, Mary, and Daniel Folletti, and at the top a figure of husband Fred Folletti is flanked by Coho salmon (Fred was adopted into the Coho Raven clan by Lillian Hammond). Fred, as the watchman on the top of the pole sits upon a Chilkat blanket. The pole originally stood in downtown Haines before being moved to the lodge. 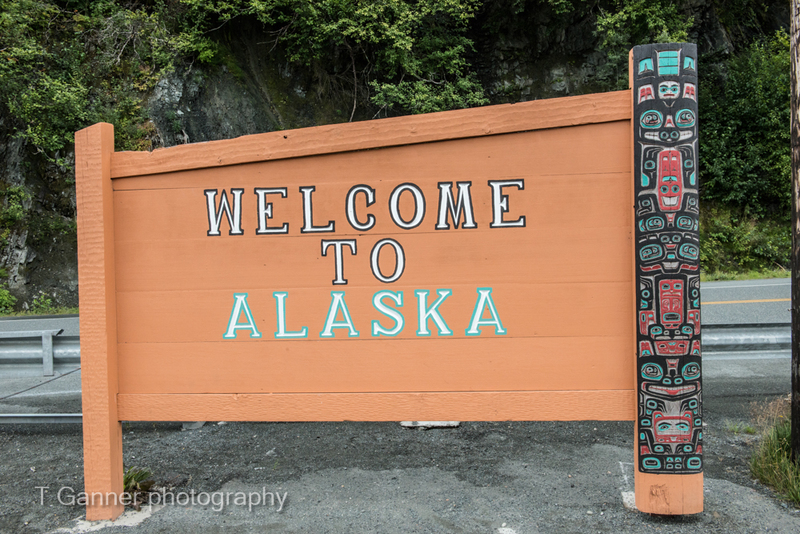 This panel originally stood at the Canadian-American border, which is why it says, “Welcome to Alaska” rather than “Welcome to Haines”. The right side of the sign is “Three Bears” by John Hagen. 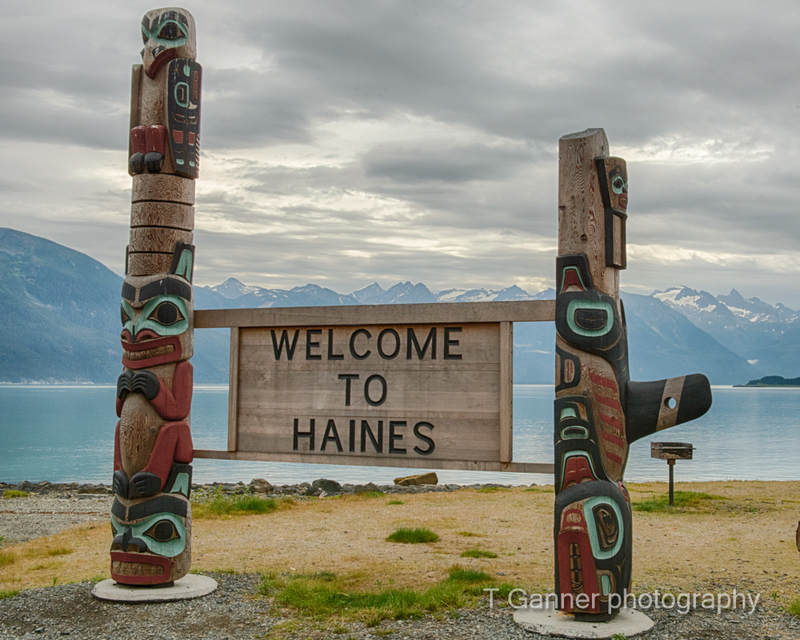 The totem poles on both sides of the “Welcome to Haines” sign located at Picture Point are actually two sections of one pole. The original pole was carved in 1979 out of red cedar at Alaska Indian Arts by the carvers listed. It was made for Frank Young, who grew up in Haines but then moved to the shores of Lake Tahoe. The pole was made for his new house by the lake, and it was originally 27 feet tall. Once installed, the base was removed so that the top of the pole was not so close to the ceiling when it was inside. However, the fin of the killer whale on the pole created a problem when dinner guests continually bumped their heads on it so the height was again adjusted. 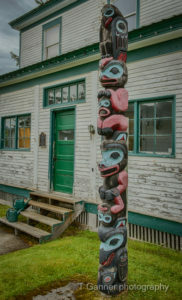 When Frank Young passed away, the new owners of the house did not want the pole so it was donated back to Alaskan Indian Arts. 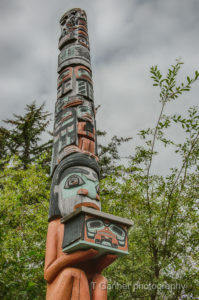 Because the house was built around the pole, a wall would need to be removed to take the totem pole out of the house, but the home owners association prohibited it. To solve the problem, AIA hired a guitar maker who lived near the Lake Tahoe house to cut the pole into two pieces, so it could be removed from the house and shipped back to Alaska. It survived the journey home and was purchased by the borough who commissioned a “Welcome to Haines” sign. The pole was originally going to be put back together once it reached Alaska, but to emulate the style of the older “Welcome to Haines” sign stationed by the fish and game office (a description of that pole follows), it was decided the pole would remain in two pieces with one on each side of the sign. When the pole was one piece, there was an eagle figure at the top, followed by two potlach rings, a wolf, a bear holding a tinae, and lastly a killer whale. When the pole was cut in two, the bears head was severed from his body with the thought that it would be reattached back in Alaska. When it was decided to leave the two pieces separate, the body of the bear was dissolved from the tinae so that one side has the eagle, potlach rings, wolf and bear head, and the other has the tinaa. One can easily differentiate eagles and ravens in totem designs. The eagle has a hooked beak, while the raven has a curved beak without the pronounced hook at the end. Also, ravens are represented with “ears” as they are very talkative and need ears to hear. In our region, ravens have a distinctive dialect which includes about 40 vocalizations. This panel signifies why people live in this area. Reading from the bottom up, the tinaa represents the cultural and physical wealth of the community. The Eagle and Raven represent family – the two moieties of Native society. The canoe is how people come to this area. The man holding the canoe is someone who has traveled here, probably a trader, since this is a trading community with commerce and wealth. The sun represents the nice weather we usually see here in Haines. The rope on the base shows how the library binds our community together. Jim also jokingly explained the piece of yellow cedar used to create the pole was the best piece of cedar he had ever worked with, and did not have a knot in the structure anywhere. It now has a knot. The crouching female figure represents the start of the Haines Borough Public Library by the Haines Women’s Club. The woman is presenting the Chilkat Valley and the Box of Knowledge. The Box of Knowledge is a time capsule to be opened in 25 years. Three Tinaas represent the cultural wealth that the library protects. They also signify the three incarnations (buildings) the library has had. The Chilkat blanket represents the Chilkat Valley and the wealth donated by founding donors of the Friends of the Haines Borough Public Library Legacy fund. The Dragonfly traditionally represents seekers of knowledge. 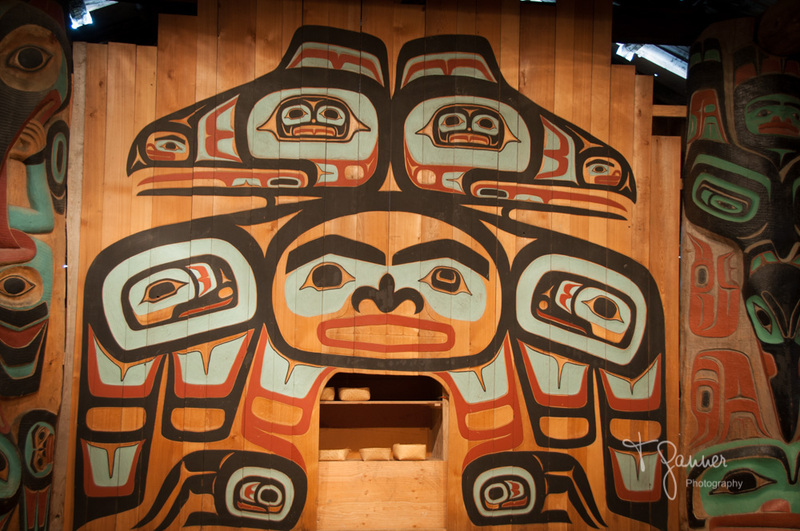 At the top, the Bear, Raven, Frog, Woodworm, Wolf, Salmon, Whale’s Tail and Eagle represent the clan of each of the carver’s involved in this project. 10-foot-tall Diving Raven pole. At the top is the diving raven, below it is a bear holding a little frog on his lap, and at the bottom, partially hidden by shrubs, is a wolf. Bill Sparks commissioned this pole to celebrate his marriage to Mildred Sparks. He was a wolf and she was a raven. Both wolf and raven are on this pole. Clifford Thomas and John Hagen, Sr. contributed to this pole. Mildred Sparks’ family was Ganaxteidi from Klukwan. Her husband, Bill, was a soldier at Fort Seward. He was adopted into the Kaagwaantaan clan in the Wolf house. The little wolf at the bottom of the pole represents him. Chris Martin is Mildred Sparks’ granddaughter. When facing the sign, the Raven pole on the left, designed by Edwin Kasko (an Eagle), is symbolic of the Raven as founder of the world in all his great powers. The raven is the top figure on the pole. The second figure is the whale, representing Alaska and its great size. The whale has its tail in its mouth. The bottom figure is the head of the frog, which shows everlasting life. The whale is a baleen-type whale, not an Orca, so it has no teeth and can hold its tail in its mouth. The frog is thought to have everlasting life because it went into the mud in the fall and came out of the mud in the spring. The frog has no teeth and its tongue is sticking out. (A bear would have visible teeth.) These are the three main clans from the Ganaxteidi in Klukwan. The pole on the right is the Eagle pole, designed by Leo Jacobs (a Raven). This pole tells of the eagle and his feeding grounds from 19 mile to 21 mile on the Haines Highway, where one of the largest concentrations of eagles in the world can be seen from October to March. The top figure is the “Overseer Eagle” or eagle crest figure; the second figure is the Salmon Chief (man holding salmon), who provides the late run of salmon to the feeding grounds; the Eagle Chief, head of the Eagle clan, is the third figure (an eagle, currently missing one wing); the bottom figure is of the Brown Bear, which also feeds on the salmon and is a symbol of strength and great size. The Salmon Chief represents the Chilkat Valley where all five species of salmon are found. This 40′ yellow cedar pole was paid for by the Larson’s, author of the book “Proud Chilkat,” to celebrate the start of the Indian Education Program in the Haines School. Originally in front of the downtown elementary school, and facing the other direction, it was relocated to the new school a few years ago. 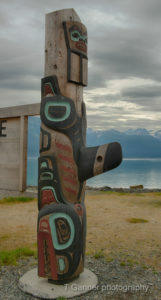 In its original location, a sign stated that the pole was “Dedicated to the children of the Chilkat Valley.” It is one of three copies of the Friendship Pole, which is held in the Sheldon Museum and Cultural Center. This one is the tallest of the three. A second one is on the Fort Seward Parade grounds (currently on the ground next to the tribal house). The third one is located in Juneau inside the Hall of Justice. Each is slightly different from the others. On display is a Killer Whale perched on top of a pyramidal stone base. When the City of Haines created their corporate seal, Carol Flegel’s design won the competition. The seal is a killer whale with a flying eagle and the ferry boat inside it. The killer whale totem was put in front of City Hall (at this time it was the administration building), because it was on the seal. John Schnabel’s lumber mill donated the log. 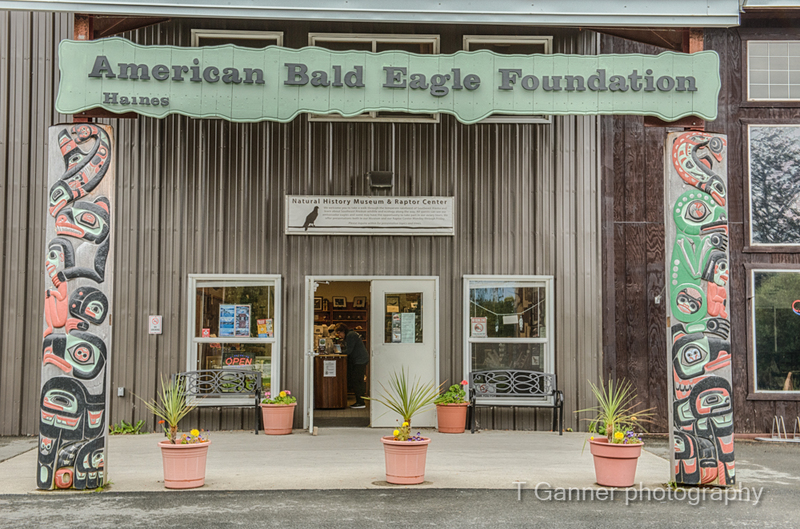 There are two yellow cedar flat poles at the American Bald Eagle Foundation flanking the entrance. These poles depict interactions between humans and wildlife in the Chilkat Valley. Throughout the poles are different representations of things, living and collected specimens, found in the American Bald Eagle Foundation. The humans are male and female, one for each of the love birds. The pole on the left is an eagle with a bear, killer whale and man on it. The eagle is on the bottom. There are little items in the eyes and body such as an owl and a crab. This pole on the right is a raven with a frog, salmon and woman on it. Outside and to the left of the tribal house is a 30 foot Raven Pole. This is one of the earliest poles done by Alaska Indian Arts. Because it is so early, the eye shapes look strange. The carvers are learning how to do form line at this time. Carvers: Alaska Indian Arts, Inc.
1959 to 1973 (poles) House started in 1959 and dedicated August 11, 1962. Named Noow hit for Victor Hotch’s recovery from double pneumonia in the hospital at the fort. He was the Hitsati (House Master) of the Whale House in Klukwan.. (Noow is the Tlingit word for fort, home, security (the safety of your home) Hit is the Tlingit word for house.). At each of the outside corners are 4 poles. The two front corner poles traveled to the World’s Fair in 1974 in Spokane, Washington. The top figure is a wolf with a frog on its chest; the middle figure is a sea grizzly with a halibut in its mouth; the bottom figure is a bear with a tinaa and there is a bear face on the tinaa. The two front poles are identical. On the front, the painting between the poles is a raven and it is one of the original screens done by Alaska Indian Arts. 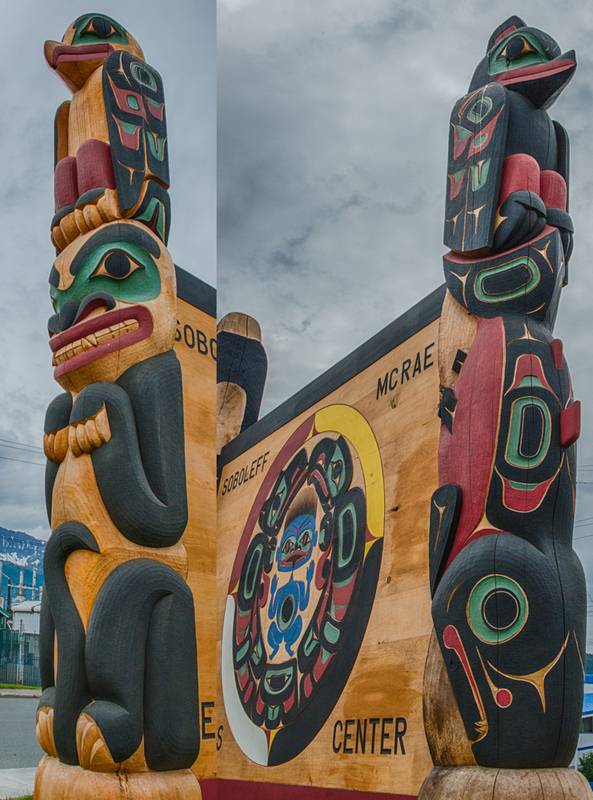 On the backside is a 35-foot Friendship Pole by Leo Jacobs, Sr. and other carvers at Alaska Indian Arts (currently on the ground). The two back corner poles are lying down next to the Friendship Pole. These two poles are the same, they have a Chief with Talking Stick on the top, a Raven in the middle, and a Frog on the bottom. The back screen is a raven with a whale underneath. It was designed and painted by Nathan Jackson with help from Tresham Gregg. 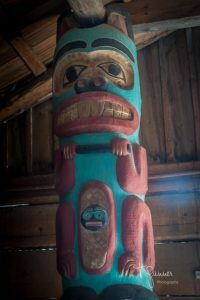 Inside the tribal house are a Beaver Pole, Raven/Whale Pole, Raven Pole and Raven/Frog Pole as well as a large Split Raven carved screen. The current carving of the screen is by Tresham Gregg. 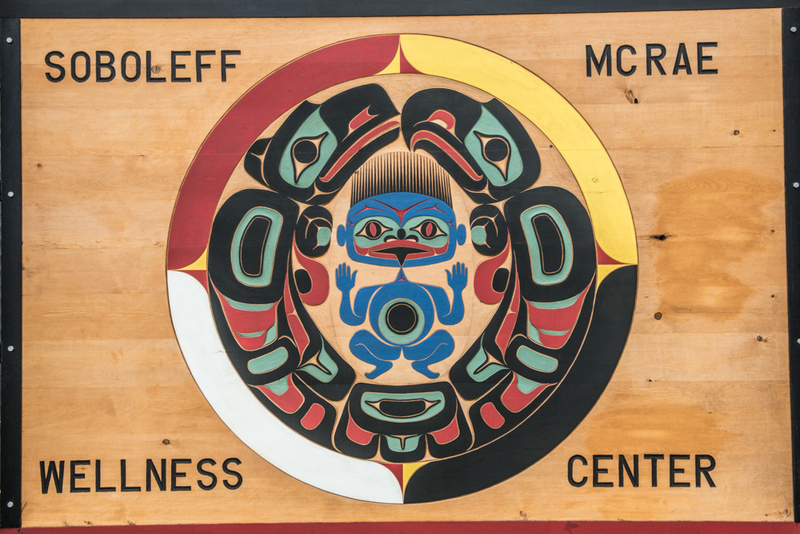 The original screen and design are by John Hagen, Sr. and it is now located inside Alaska Indian Arts. For awhile it was the backdrop at the Chilkat Center. There is a silk screen print of this design available at Alaska Indian Arts. The pole to the right of the screen was carved by Bill Holm and Jeff David, Sr. in 1959. 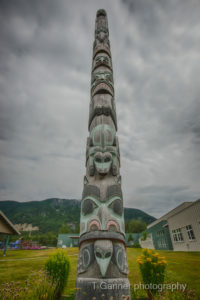 This was the first large totem pole carved in Haines in many years. It has a Frog on the bottom and a Diving Raven on the top. This is Carl Heinmiller’s name pole: “Khawhoos Bau” or “Sound the Raven Makes with Its Wings.” This sound is also likened to beating on a Tinaa. Bill Thomas has the same name. This pole stood outside the tribal house for a number of years before any other poles were carved. Because of this exposure, the cedar surface is grey. Notice the human face in the body of the split raven design. The face represents Carl Heinmiller. Carl wore an eye-patch, and the figure on the screen has one malformed eye. The pole to the facing left of the screen was the first pole carved by Tresham Gregg, dated 1960/61. It is Judy Heinmiller’s name pole. It features a Raven looking at his reflection in the water. The top raven is holding a face with arms, which is his imagination. The bottom raven is the reflection. Judy’s Tlingit name means “Looking in the Water” because of her blue eyes. The pole to the left of the entrance door, when one’s back is to the screen, was carved by Carl Heinmiller in 1963/1964. The top figure is a beaver with a stick in his hands. The beaver tail is folded up. Underneath him is a hawk and a frog. This early carving is much more primitive than later poles created by AIA. Eyes looks strange and are uneven. The pole to the right of the entrance door, as one faces the door from the inside of the building, was carved by John Hagen, Sr. about 1974. The top figure is a Raven with a protruding beak. Underneath the Raven is a Whale. A 12 foot pole representing the legend of Jonico and the Kooshtakaa that starred in a Disneyesque movie created by Chuck Keen in Juneau. Tony Williams was the young star, Jonico.Jimmy Kane from Dezadeash Lake was the grandfather figure. The pole was made for the movie, Kóoshdaakáa is the land otter man. He is thought to be able to steal away your spirit. This was a coming of age movie with the grandfather guiding the young man into adulthood. The figures on the pole, from top to bottom, are: eagle with salmon, Kooshdaakáa with spirit head, wolf with hands holding an upside down human head (head and arms- possibly representing Jonico) and sea wolf. 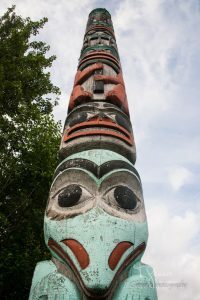 A 37-foot Raven Pole titled “Raven, Guardian of the Clans.” This was the only Alaska Indian Arts pole where each carver did one figure. (Usually all the carvers worked together on the entire pole.) All of the figures are clans within the Raven moiety. Dedicated by Mildred Sparks at the remodel of the Chilkat Center. 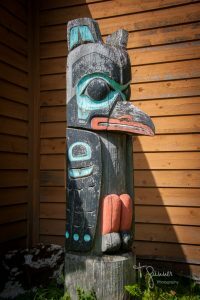 A 7-foot Raven Pole carved in yellow cedar. This 16-foot Eagle Family Pole took 1,000 hours of carving time. It was purchased by the City of Haines from Carl Heinmiller and Alaska Indian Arts. 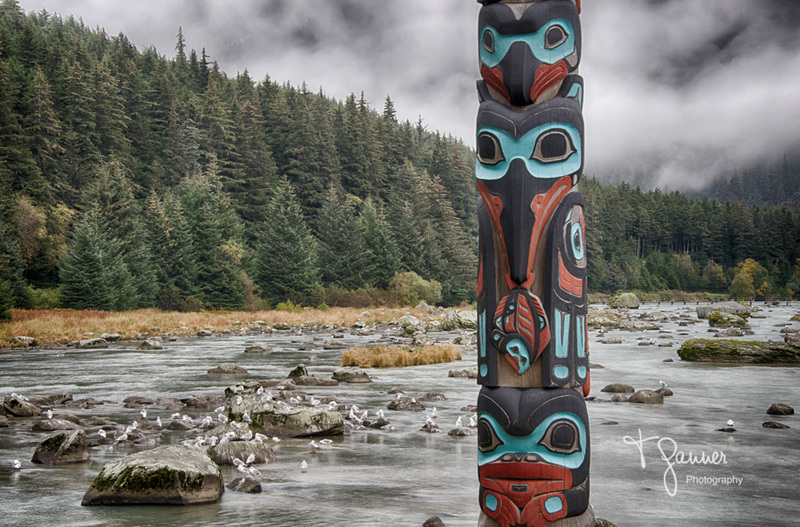 This pole inspired Jim Heaton to start carving totem poles. David Svenson now carves on collaborative pieces with Pilchuck glass artists in Washington state. This pole wasn’t carved specifically for this spot. It was at Alaska Indian Arts for a while. Peter Goll, while in the legislature, obtained $10,000 for Haines to install this pole in the Lookout Park pavilion. At the bottom of the pole is a Chief holding a copper tinaa (money piece) with an eagle design on it and wearing a clan crest hat with a little eagle on it and basket rings at the top. He is holding his wife up on top of his head and their child is sitting on her lap. She has a labret in her lower lip. The coho salmon is draped across her head. The coho is a raven crest – the wife is the opposite clan of her husband, who is an eagle. Above that is the guardian figure of the pole, an eagle. And above the eagle are two guardian figures. 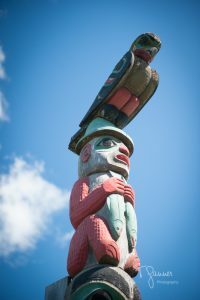 Guardian figures are more common on Haida poles. This is the eagle family pole for the Chilkat Valley. One guardian is facing up the Chilkat Valley and one is facing up the Chilkoot Valley. On the top of the potlatch hats on the top of the guardian figures, there were originally brass welding rods that looked like sea lion whiskers. These are not usually on this style of hat, but they discouraged birds from sitting on the top of the pole. The wires were taken off a few years ago when lead caps were put on the top of the pole. This 10-foot-tall pole represents and celebrates the Sheldon Museum. The bottom has the box of knowledge with the Fort Seward muster bell and two tinaa representing financial support. Above are a man woman and child representing museum visitors. Above that is bear, representing the wildlife of our region, with a canoe with a tourist inside representing the Chilkat valley trade corridor in its paws. Above that is a raven and eagle, representing both moieties in our community, and at the very top is the Museum’s Chilkat blanket. As usual—so well done. And aren’t they beautiful? I can just imagine the love and patience that has gone into these. Thanks so much for your extensive research/history and the great pictures! Good job Tom. I learned new things here. Did you consider the Raven House Raven on Beach Road? I was basically following the route of the Totem Trot, to support that effort. Raven House is not along the route. Tom! 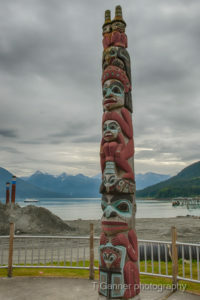 Thank you for penning the wonderful article capturing the amazing totem carvings on poles and signs in Haines, Alaska. And your photos! A few hours ago my daughter, Anna–aka MOMMY POPPINS posted her Haines story on things to do with kids in Haines and linked to your article. Check it out: https://mommypoppins.com/kids/family-travel/insider-guide-to-haines-alaska-21-top-things-to-do-in-haines. It will be interesting to see how many people get to the Haines post and your article. Mommy Poppins gets 33,000,000 hits a year!